Get in Gear with Goblins vs Gnomes - Now Available! A slew of mechanized minions have taken over the battlefield with Hearthstone’s first expansion pack: Goblins vs Gnomes! Catch all of the unpredictable action between the cunning, explosive-loving goblins and the contemplative ever-tinkering gnomes by adding over 120 all-new Hearthstone cards to your collection. Explore new class-specific cards, recruit Legendary minions, and power up your forces with the new minion type: Mechs. Join us in celebrating the release of Goblins vs Gnomes with free cards! 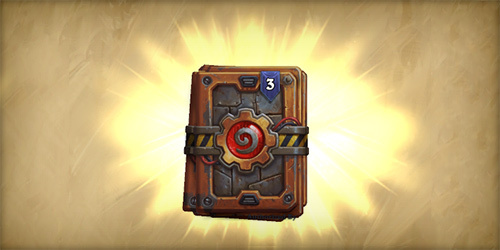 All players who log in to Hearthstone from now until December 19 will immediately receive three free Goblins vs Gnomes card packs! Whether you’re logging in and playing from your PC, Mac, or iPad, everyone will be able to share in the excitement. Don’t miss out—the fuse has been lit on this limited time celebration! Eyebrows still growing back from that last bit of explosive news? Watch your friends plot their next move from a safe distance with Spectator Mode! Spectator Mode allows you to watch a friend’s Hearthstone game in progress as if you were the one sitting in the piloted shredder’s seat. When in Spectator Mode, it’s easy to look at the cards in your friend’s hand, see the play-by-play history, and watch the action unfold in real time. You’ll also find Goblins vs Gnomes cards available as you construct decks in the Arena—and as a reward at the end of your run. 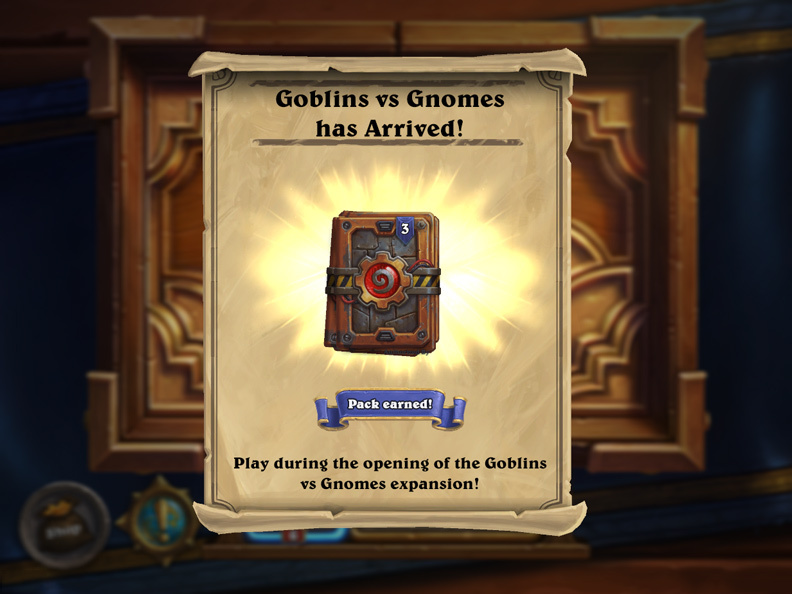 Regardless of how well you do in the Arena, a Goblins vs Gnomes pack is waiting, so get in there and start a new Arena run today! Getting into Goblins vs Gnomes is easy—no safety gear required. Goblins vs Gnomes card packs can be purchased for the same price as Hearthstone’s Classic card packs through the in-game Shop. Goblins vs Gnomes packs include five Goblins vs Gnomes cards, with at least one Rare or better card in each pack. The original Classic card packs can still be purchased from the in-game Shop as well for those looking to complete their collections. Looking to build some new Mechs of your own? Both normal and golden Goblins vs Gnomes cards can immediately be crafted with Arcane Dust! Head on over to the Crafting tab in My Collection to start building up your mechanical army right away. Get in gear with Goblins vs Gnomes, now available on PC, Mac, iPad, and Windows 8 Touch—and coming soon™ to Android tablets.